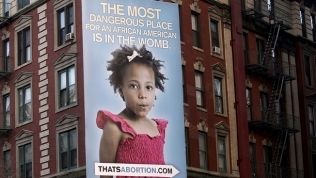 *The mother of a 6-year-old girl whose photo appeared on an anti-abortion billboard targeting African Americans is suing the ad company that created the campaign, claiming it violated the terms her contract. The ad triggered a tsunami of outrage, culminating in the Reverend Al Sharpton threatening to picket its location near the mouth of the Holland Tunnel in Manhattan. But the Christian group eventually bowed to public pressure and took the ad down. The photo was purchased by Heroic Media from the photo agency Getty Images with the agreement that it would not be used “in connection with a subject that would be unflattering or unduly controversial to a reasonable person,” a condition that she charges Heroic violated. Fraser said that as a result of the controversial ad she was forced into the awkward position of having to explain to her daughter about the birds and the bees—and what it had to do with her picture appearing in the national media. “While Life Always and Heroic Media certainly have the right to engage in such offensive speech, they do not have the right to exploit the likeness of an innocent child to do so,” she says in the complaint. Fraser also claims her daughter’s budding modeling career, which had been taking off since the 2009 photo shoot, is now in a tailspin. “Anissa has also suffered from emotional distress resulting from the use of her image in the New York billboard, as well as damage it has caused her career,” the New Jersey mother says in court papers. Yup. Sounds like a violation of the contract. Of course something like that is relative but I hope she wins. Of course she has to look at herself in the mirror when she talks about exploiting her child. Putting your child out there like that is always risky. ‘If’ that statement is indeed included in the agreement she signed, the media company MAY have breached the contract. However, if this mother wants her child to pursue modeling she’s going to have develop a thicker skin because there are always going to be ads/campaigns/companies that may offend her. Futhermore, in future photoshoots of her child, that particular clause may NOT be part of the agreement she signs. She could potentially be signing over complete ownership of her daughter’s image/likeness to the photographer or modeling agency. As I wrote in the comment section associated with the first article EUR posted on this topic, the lesson the mother should have learned is to fully read any agreement she signs and to become as educated as she can on IP rights in regards to an individual’s rights to his/her image and/or likeness.